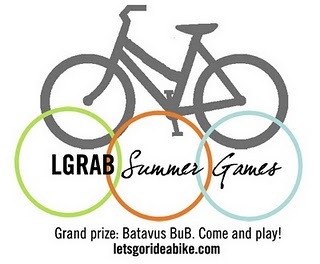 Round one of the Let's Go Ride a Bike Summer Games ends today, and I have finished my second challenge just in time! I decided to leave a friendly note on a bike, and this morning I dragged Nathan to campus (on a Sunday, no less!) to find a nice looking bike locked up in the sun. I wrote out my note beforehand and used a safety pin to securely (and sweetly!) attach it to the bike. I hope whoever finds it enjoys it! In the meantime, I am looking forward to round two of the Summer Games: Learning Experiences. I already know that I'm going to perform a big maintenance task on my bicycle (long overdue) and I'm excited about the other options available. See you then!